When you work at a University, you get use to meetings, lectures, and the like. I keep my sketchbook handy (whether the I-Pad or the hard copy one). Here is what I came up with at our end of the year meeting in 2011. 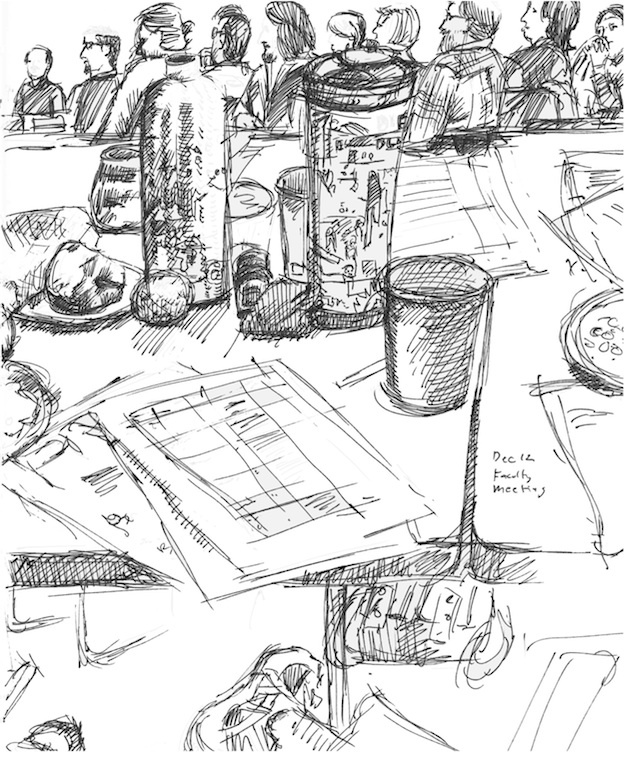 Paperwork, people, beverages and snacks dominate the image, with my shoe poking in at the bottom of the page. I can’t remember what we discussed, but this isn’t a bad little sketch that I got out of it. This entry was posted in Thoughts and Sketches and tagged art journaling, drawing, drawing a prayer, drawing as prayer, drawing of a meeting, sketch, sketchbook, sketchbook images, sketchbook keeping, sketching. Bookmark the permalink.